Enjoy some bold brass sounds over your lunch break for the 2019 return of our Midday Music series! 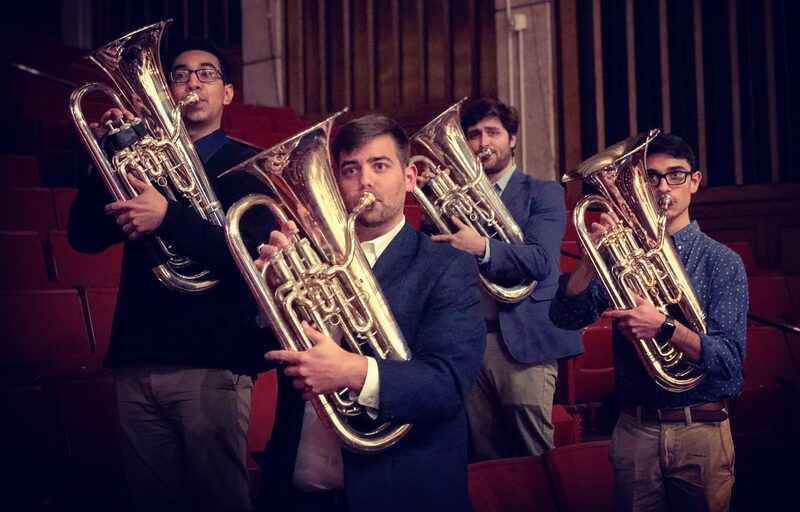 This performance will be from The Butler Brass Quartet, comprised of adventurous euphonium players from the studio of Charles Villarrubia at the University of Texas’s Butler School of Music. Jose Flores, Kevin Fenske, MJ Jadeja, and Matthew Kundler have been invited to perform as part of prestigious festivals and competitions such as the Falcone Euphonium Competition and Festival, Lieksa International Brass Festival, the Rafael Mendez Brass Institute, the International Tuba and Euphonium Conference, and the Concours Prestige International. Driven by a passion for eclectic blends of music, the Butler Brass Quartet uses its instrumentation like a blank canvas to bring diverse music from string quartets, vocal selections, contemporary repertoire, and rock tunes to their audiences. This event is included in the price of admission. Free for members and UT students, faculty, and staff.